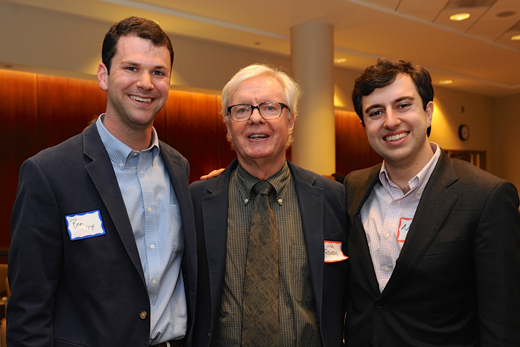 As James Roark (center), Samuel Candler Dobbs Professor of American History, steps down after 33 years at Emory College, young alumni have endowed an award in his honor to fund student research. Posing with Roark are the organizers of the new Roark Prize, 2014 graduates Ben Leiner and Naveed Amalfard. James Roark insists, repeatedly, that his retirement isn’t only about him. After 33 years at Emory College, it should be no surprise that the Samuel Candler Dobbs Professor of American History is right. Roark will step down this year. And his retirement will be, in part, about the students who starting next year can win the newly created Roark Prize, endowed by young alumni for undergraduate research in the United States. “Undergraduate research is a huge priority and need, and a definite fit for his legacy,” says Ben Leiner, a 2014 history and economics graduate and co-organizer of the new prize for the professor who oversaw his honors thesis. “I changed my major after one course with him. Dr. Roark is not simply an excellent teacher and scholar; he is someone you want to model your life after." Roark was born in Louisiana but grew up in the San Francisco Bay area. The son of a pipefitter who expected at first to do similar work, he was uncertain about a career as he earned a bachelor’s degree from the University of California-Davis. After serving three years with the Peace Corps in Nigeria, he went on to graduate school at Stanford University. There, his doctoral dissertation was awarded the Society of American Historians’ Allan Nevins Prize. That and his books, “Masters without Slaves: Southern Planters in the Civil War and Reconstruction” (1977) and “Black Masters: A Free Family of Color in the Old South” (with Michael Johnson, 1984), solidified him as an expert on the history of the American South. Roark has been recognized not just for researching that more varied landscape but also for training undergraduates and graduate students to do the same. Naveed Amalfard discovered Roark’s passion for teaching firsthand. As a freshman majoring in business, he talked his way into an upper-level course taught by Roark. He not only excelled but convinced his friend, Leiner, to take the same course as soon as he could. "Plenty of history left to do"
Amalfard and Leiner surprised Roark with news of the prize bearing his name at his recent retirement celebration. Working with Development and Alumni Relations, the pair has already generated about $30,000 in gifts for the award. That legacy will live on the new award bearing his name. The vision is that funds will be available for rising seniors pursing an honors thesis who need to travel for their research. Roark says he is pleased with the prize, and for the department he has been a pillar in building to remain committed to both teaching and research. He plans to spend the next few weeks helping move the 1,600-1,700 volumes in his personal library to North Greenville University. Another former doctoral student, Paul Thompson, is now dean in the university’s College of Humanities and chair of its history department, and Roark loves that his teaching library will continue on there. Roark also is putting the finishing touches on his ongoing project, the textbook “The American Promise,” which is about to release its 7th edition. He plans to be active in Emory’s emeritus programs and be a regular at a new office in Woodruff Library.